The comet was discovered on October 23, 1969 by the Ukrainian researchers Klim Churyumov and Svetlana Gerasimenko. Churyumov was born on February 19, 1937 in Mykolayiv, Ukraine, was a corresponding member of the National Academy of Sciences of Ukraine, and director of the Kyiv planetarium. Soviet and American astronomers named a comet, as well as small planets №2627, №3942, and №6646 after Churyumov and his family members. Gerasimenko was born in the town of Baryshevka, Ukraine. The comet and minor planet №3945 are named in her honor. On March 2, 2004, the Rosetta spacecraft of the European Space Agency was launched from Kourou in French Guiana, which goal was to study Churyumov‑Gerasimenko comet. Churyumov and Gerasimenko were guests of honor at the launch. The device reached the comet in November 2014. After remote study of the cosmic body, the Philae Lander for the first time in the history of mankind landed on the comet on November 12, 2014. 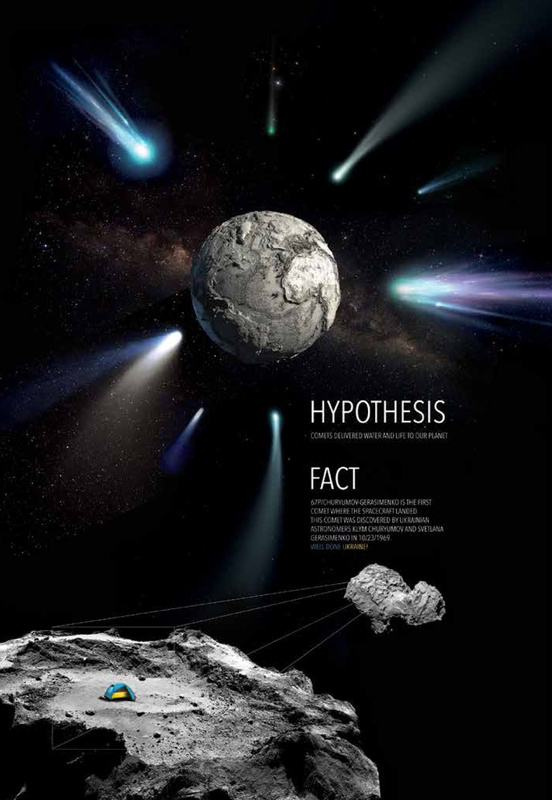 Research of Churyumov‑Gerasimenko comet continues until today.